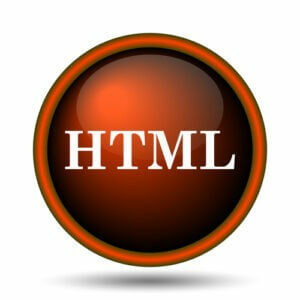 HTML icon. Internet button on white background. Photo courtesy of Shutterstock. If you are interviewing for a job about HTML and HTML5, the following post has interview questions and answers to help you prepare. Whether you’ve studied HTML, HTML5, or other web development languages via college courses, online courses, boot camps, or self-study, there will come a time when you need to get a job and the gateway between you and gainful employment is the interview process. If you’ve started your own website or are a freelancer, you can count yourself among the lucky few because everyone else has to go through the dreaded interview process. While it seems daunting, you can still sail through your interview effortlessly and land that job–or at least the second interview–with some clever preparation. We got rid of the generic interview preparation questions, making instead a list of questions that will help you prepare for a tough job interview focusing on HTML, HTML5 and other web development tools. Get these on your memory drive and you’ll be well on your way to a successful HTML coding career. Believe it or not, some people find that the most difficult part of the interview is the icebreaker portion that involves small talk and requires some clever improvisation on your part. You can prepare by knowing some of the questions potential employers might ask during this interview phase. Come up with a good story for each of the questions. If you don’t have an answer for these, then maybe you are not as gung-ho about web design as you thought you were. 1. Have you learned something new or interesting lately? Make sure you know all the relevant news and blogs. You shoud be reading them regardless, but doing so on a daily basis during your job search is important. Be ready to talk casually and fluently about the latest web trends. 2. Why did you get into coding, programming, etc.? “Because I can make good $,” “I don’t like to dress up or shave,” and “because I loved the movie Hackers,” are not good enough answers. Well… a comment about Hackers might fly but make sure you have a real backstory that describes your “Aha!” moment. 3. What is your preferred development environment? This is your chance to talk shop and demonstrate some industry knowledge. Be prepared to talk about your favorite editor, browser, plug-ins, operating system, and other tools. Freshen up on your lingo. 4. What is the coolest thing you ever coded? Do you have any personal projects you are working on? These two questions are interchangeable. Any developer worth his weight had to practice somewhere or on something before they landed their first gig. If not, how did you get this interview anyway?! Review your past experiences, and even if they were boring to you, figure out a new frame of reference that demonstrates passion and a zest for learning.